The latest national survey by the Pew Research Center, conducted September 4-8 among 1,506 adults, finds that 54% say household incomes have “hardly recovered at all” from the recession. Nearly as many (52%) say the job situation has barely recovered. By contrast, majorities say that the stock market and real estate values have at least partially recovered from the recession (74% and 63%, respectively). But relatively few say that even these sectors have fully recovered (21% stock market, 4% real estate values). Government policies in response to the recession are seen as having done little to address the uneven recovery. 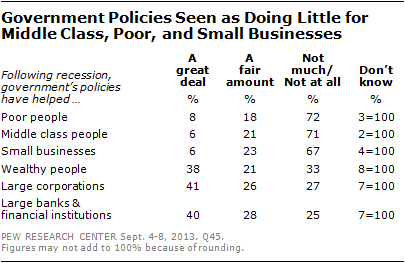 Broad majorities say the government’s policies following the recession have done not much or nothing at all to help poor people (72%), middle-class people (71%), and small businesses (67%). Yet majorities say government policies have done a great deal or a fair amount to help large banks and financial institutions (69%), large corporations (67%), and wealthy people (59%). Despite concerns over the security of the economic system and fairness of government economic policies, the public is deeply divided over federal regulation of markets and financial institutions. Overall, 49% say government regulation of markets has not gone far enough leaving the country at risk of another financial crisis, while nearly as many (43%) say government regulation has gone too far making it harder for the economy to grow. In May 2010, just before Congress passed financial regulation legislation, the public was similarly divided: 46% said they were worried the financial regulation legislation would go too far, 44% expressed concern that they would not go far enough. The belief that the U.S. economic system is no more secure today than it was before the financial crisis is widely shared across demographic groups. There are partisan differences, however, with Democrats more likely than Republicans or independents to say that the system is more secure. 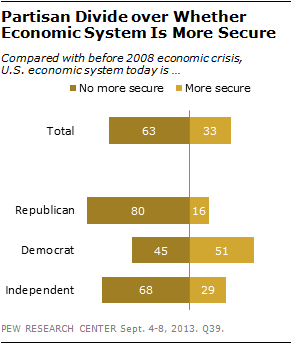 Large majorities of Republicans (80%) and independents (68%) say the economic system is not more secure than prior to the financial crisis. Democrats are divided: 51% say the system is more secure today while 45% say it is not. There also is substantial disagreement between Republicans and Democrats over whether the government has gone too far or not far enough in regulating markets and financial institutions. By two-to-one, more Republicans say government regulations have gone too far making it harder for the economy to grow (64%), than say they have not gone far enough leaving the country at risk of another financial crisis (32%). 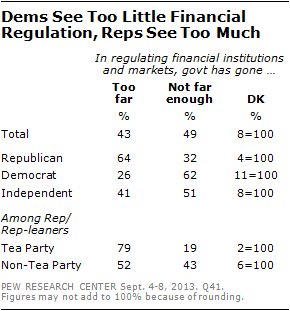 Opinion among Democrats is the reverse: just 26% say the government regulations of financial institutions and markets have gone too far, while 62% say they have not gone far enough. Independents are divided: 51% say regulations have not gone far enough, 41% say they have gone too far. Among Republicans and Republican leaners who agree with the Tea Party, far more say government financial regulations have gone too far (79%) rather than not far enough (19%). Republicans who do not agree with the Tea Party are much more evenly divided: 52% say regulations have gone too far, 43% say not far enough. 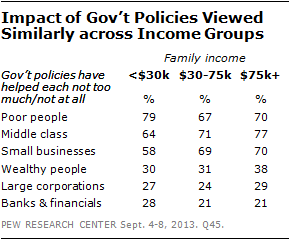 The beneficiaries of these policies, in the public’s view, are large banks and financial institutions, large corporations and wealthy people: Sizable majorities say government policies have helped all three at least a fair amount – 69% say that about large banks and financial institutions, 67% large corporations and 59% wealthy people. There are only modest differences on this question across income groups, with general agreement over which groups have been helped – and not helped – by the government’s economic policies. For example, 79% of those in households earning less than $30,000 a year say government economic policies have done not much or nothing at all to help poor people; among those with family incomes of $75,000 or more, a similar 70%-majority shares this view. And while there are wide partisan gaps in opinions about government financial regulation and whether the economic system is more secure, there is some common ground in opinions about which groups have been helped by government economic policies since 2008. For instance, nearly identical majorities of Republicans (73%), Democrats (71%) and independents (70%) say that government policies following the recession have done little or nothing for poor people. And while 70% of Democrats and 73% of independents say large banks and financial institutions have been helped at least a fair amount by government policies, 62% of Republicans agree. However, Democrats are more likely than Republicans to say that the wealthy, large corporations and small businesses have benefitted from government policies undertaken since the recession began. More than four years after the end of the recession, roughly half say that household incomes and the job situation have hardly recovered at all. Casting these views in an even more negative light is the perception that other economic sectors – the stock market and real estate values – have seen more of a recovery. 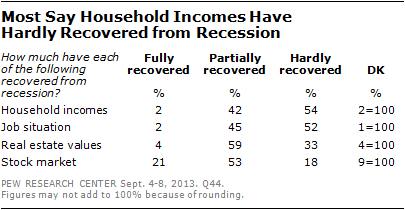 Overall, 54% say household incomes have hardly recovered at all from the recession, 42% say they have partially recovered and just 2% say they have fully recovered. Attitudes toward the job situation are very similar (52% hardly recovered, 45% partially recovered, 2% fully recovered). hardly recovered at all from the recession. 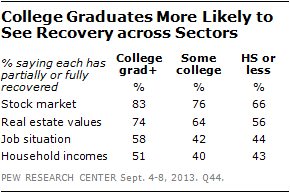 College graduates are more likely than those with less education to see recovery across all four economic sectors tested in the survey. For example, nearly six-in-ten college graduates (58%) say the job situation has at least partially recovered, compared with just 42% of those with some college experience and 44% of those with no college experience. The rece ssion’s impact can still be clearly seen in how people describe their personal financial situation. 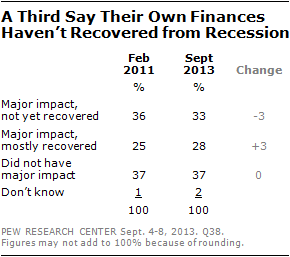 Overall, 33% say the recession had a major impact on them and their finances have not yet recovered, 28% say it had a major impact on them but their finances have mostly recovered, while 37% say the recession did not have a major impact on their own personal financial situation. The percentage saying the recession had a major impact on their financial situation and they have yet to recover has remained stubbornly flat over the course of the last several years. In February of 2011, 36% said this, almost identical to the 33% who say this today. 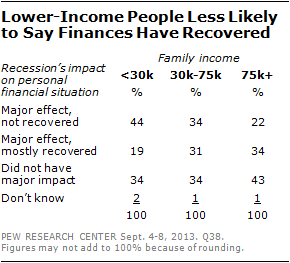 Low-income respondents are the most likely to say that the recession hurt their personal finances and that they have yet to recover. Overall, 44% of those with family incomes of less than $30,000 a year say their finances have not recovered from the recession, double the percentage among those with incomes of $75,000 or more. Five years after the financial crisis, views of the national economy still remain negative. Only 19% rate the economy as excellent or good. By contrast, about a third (32%) rate the economy as poor and roughly half (48%) say economic conditions are only fair. While perceptions of the economy are negative, they are much less so than during the depths of the economic recession. In February 2009, 71% rated economic conditions as poor and only 4% rated the economy as excellent or good. The share rating economic conditions as poor had more than doubled between January 2008 and February 2009 (from 28% to 71%). Perceptions of the economy have become less negative just over the course of this year. In January 2013, 49% said the economy was poor, 17 points higher than today. Currently, roughly equal percentages expect the economy to get better (28%) as worse (25%) in the coming year. For most of Obama’s presidency, economic optimism has outweighed pessimism. This is only the second time since Obama became president when economic optimism did not significantly exceed economic pessimism. there was unusual partisan agreement in evaluations of the economy. Comparable percentages of Democrats (73%), independents (72%) and Republicans (67%) said the nation’s economy was in poor shape. Since then, the percentage rating the economy as poor has fallen across the board, but much more steeply among Democrats and independents than Republicans. Today, just 19% of Democrats view economic conditions as poor, compared with 33% of independents and 44% of Republicans. The public’s economic expectations have shown less change over the past four years. Currently, 25% say they expect economic conditions to worsen in the coming year; 18% said this in February 2009. In the current survey, more Republicans (39%) than independents (25%) or Democrats (11%) expect the economy to get worse. 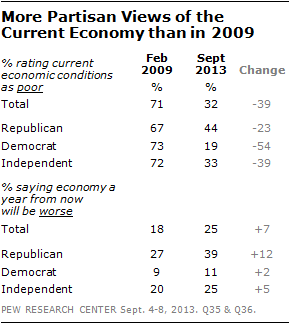 In February 2009, 27% of Republicans, 20% of independents and 9% of Democrats said the economy would be worse in a year. Overall, 40% say that the job situation is the national economic issue that worries them most, while somewhat fewer cite the budget deficit (24%) or rising prices (22%); just 10% say the condition of the financial and housing markets is their top economic worry. The percentage citing the job situation as their top economic worry has increased eight points since March, when concern over rising prices rivaled the job situation as the public’s top economic worry. 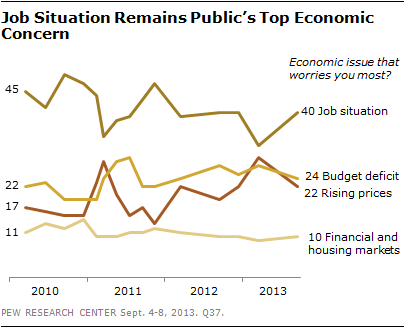 For most of the past three years, the job situation has been the public’s top economic worry. 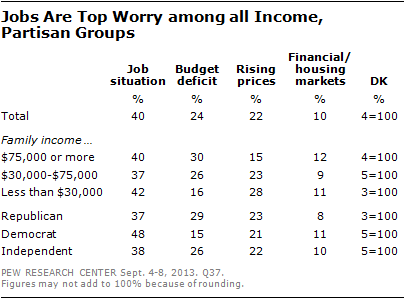 Pluralities across income levels and partisan groups cite the job situation as their top economic worry. However, while jobs are the top concern for Republicans and Democrats alike, a greater share of Democrats (48%) than Republicans (37%) say this. Republicans (29%) are more likely than Democrats (15%) to cite the budget deficit as their top economic concern. Currently, 43% appr ove of the way that Barack Obama is handling the economy, while 52% disapprove. Obama’s job rating on the economy has shown little change this year. Views of Obama’s handling of the economy have been consistently more negative than positive since shortly after he took office in early 2009. 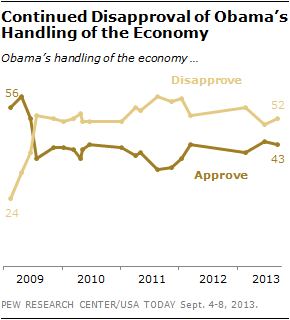 Republicans disapprove of Obama’s handling of the economy by an 85%-12% margin, while Democrats approve 75%-19%. Most independents (56%) disapprove of the job Obama is doing on the economy, while 38% approve. 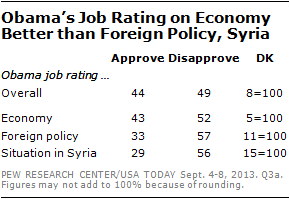 Obama’s current rating on the econom y is similar to his overall job rating (44% approve, 49% disapprove) and much higher than is ratings for handling the nation’s foreign policy and the situation in Syria. The Republican Party holds a slim advantage over Democrats as the party seen as best able to deal with the federal budget deficit and with banks and financial institutions. By a 43%-35% margin, somewhat more say the Republican Party than the Democratic Party can do the better job dealing with the budget deficit. In January the public was divided over which party could do the better job (40% Republican Party, 39% Democratic Party), though Republicans have often enjoyed a slight advantage on the issue in recent years. By a similar margin (41%-35%) the GOP also has the advantage as the party best able to deal with banks and financial institutions. 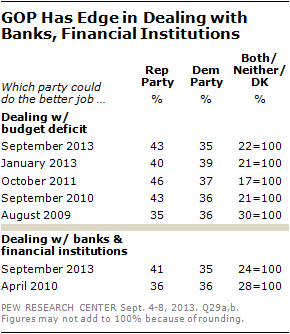 When the question was last asked in April 2010, during congressional debate on regulating banks and financial institutions, opinion was divided (36% for each party). 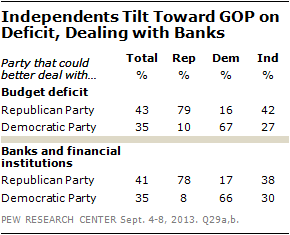 Independents lean toward the GOP as the party best able to deal with both the budget deficit (42%-27%) and banks and financial institutions (38%-30%). In addition, a greater percentage of Republicans than Democrats favor their own party to deal with the budget deficit (79% of Republicans vs. 67% of Democrats) and banks (78% of Republicans vs. 66% of Democrats).